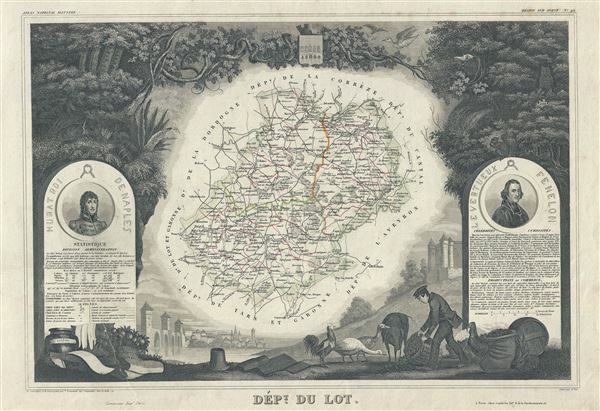 This is a fascinating 1847 map of the Department du Lot, France. This region is known for its agriculture, distilled spirits, wines, and fine hunting. The capital is Cahors. Cahors wines are rich reds excellent with duck. This area is also an important stopping point on the historic Chemin du St. Jacques, or the mediaeval pilgrimage route to Santiago de Compostella. The whole is surrounded by elaborate decorative engravings designed to illustrate both the natural beauty and trade richness of the land. There is a short textual history of the regions depicted on both the left and right sides of the map. Very good. Large repaired tear near bottom margin. Blank on verso.